Living on 5 acres of farmland in rural Minnesota, Nick Rodgers is pretty used to seeing animals hanging around his house. Over the years, one of his favorites has become Princess, a feral cat with bright orange fur who will pop in from time to time to visit him. 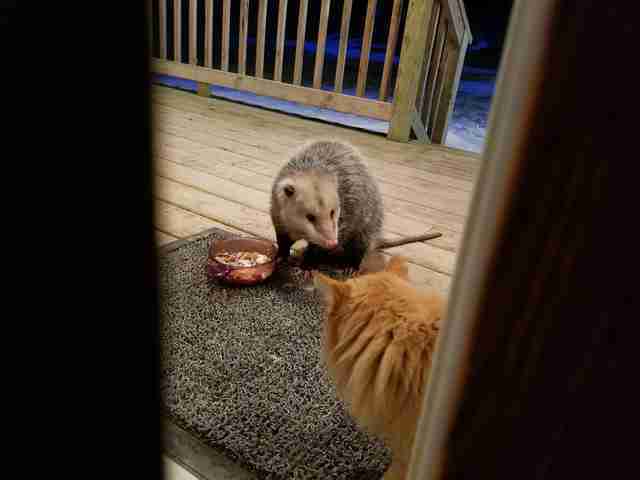 One night earlier this month, however, Princess came to visit and had a rather unusual dinner guest in tow: an opossum. 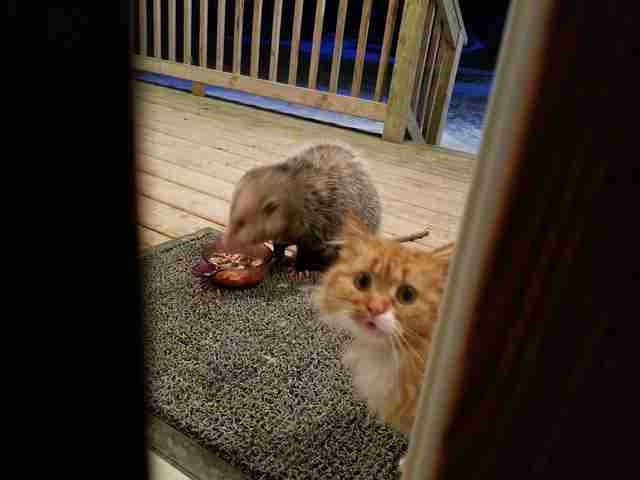 Just like Princess does, the opossum wandered up onto the porch and started eating the bowl of food sitting out. Luckily, Princess had already eaten her own meal beforehand, so the skinny-tailed critter was allowed to indulge to his liking. Princess, of course, still looked as if she wanted another bite — but both parties were very polite. 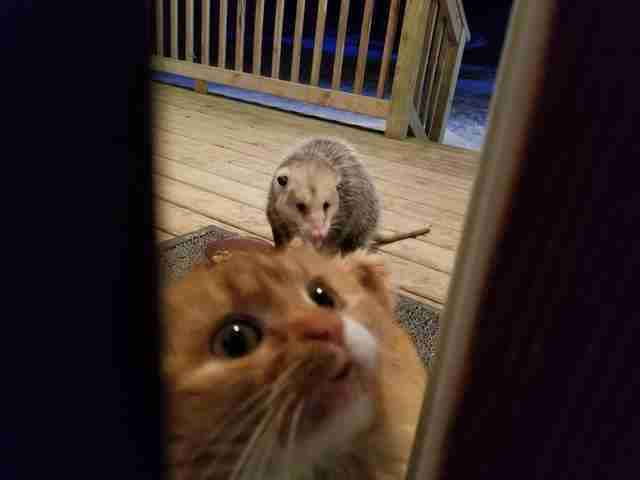 This isn’t the first time the cat and the local opossums have hung out together. 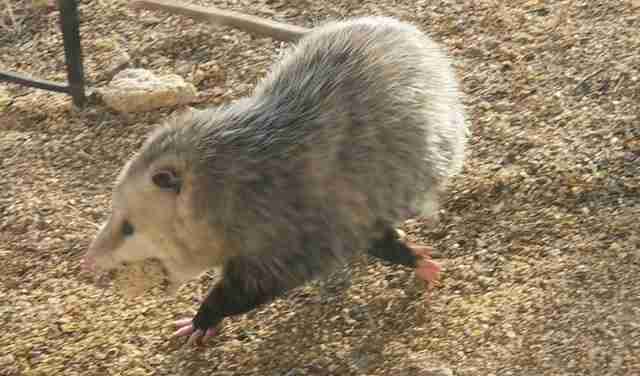 Although Rodgers had been surprised the first time he saw Princess with the opossums, he soon realized that they have learned to coexist quite peacefully. Seeing how gentle the opossums are toward Princess, Rodgers hopes he can help break down the bad reputation the species has — and encourages people not to chase them away if they’re spotted hanging around the woods. 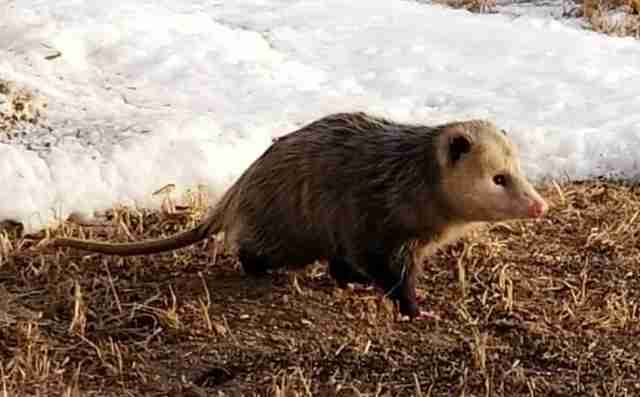 One common misconception about opossums is that they carry rabies — but they are actually extremely resistant to the disease.